Can I use my own design on a napkin? What determines my price for an order of napkins? I would like blank napkins can I order them? Can I order napkins in any size breakdown I want? I'm out of napkins, can I reorder? I need my napkins fast what are my options? Get in touch with us by phone, email, or through our online chat. Call us at 800-915-3535 or send us an email using our contact form. Monday thru Friday from 9 AM to 5 PM EST. Of course! We will answer any question about our products. The menus on the left side or top of the page can be used to find what you are looking for. If you can't find a product on our website, contact us. We have more products than we can list. What you find on the website are what people buy most. The website has 2 areas the shopping cart / payment and regular website. The regular website is not secure, but the shopping cart is. We know the importance of security and take it seriously, and when you go to make a purchase your information is going through a secure channel. Yes, almost all of our napkins and other items are available as samples. Products that are over $5.00 will have a charge for them plus shipping costs. If an order is placed from that sample, we will refund you the sample cost minus the shipping. The refund will only apply if the order is placed for the requested sample item. Yes, rush service for our products and most quantities. Rush service will incur an additional fee and please contact us for more details. Standard production is typically 5 to 7 days. Production time may vary from one product to the next. Artwork can be sent via US Mail by CD or even a USB drive (which we can happily return to you.). Sometimes we can even work with a sketch or art that is mailed or faxed in. We are here to make it as easy as possible for you! An art charge can apply though, but we strive for very low art costs to make things as economical as possible. We accept and prefer vectored art in an AI, EPS, or PDF formats, but we can except GIF, JPEG, SVG, TIFF files for review. Raster or bitmap files (GIF, JPG, SVG, TIFF) can require an art recreation charge of $30 to convert them to vector. Yes, you can use a custom design on your napkin. If you are supplying the artwork make sure it is an acceptable format. The pricing online typically includes the quantity of napkins desired, a 1 color imprint, and the setup charge for 1 color imprint. It can vary from product to product and it is listed on the website. Cancellation of an order is possible, but must be done quickly! As long as we haven't made any plates or screens, we will cancel your order without any additional charges. Just give us a call ASAP if you encounter a need for cancellation. Yes, the minimum quantity on napkins is listed on the price chart for each product. Contact your Sales Rep or anyone in Customer Service who can help you with your promotional napkin order. Contact your Sales Rep or anyone in Customer Service who can help you with your custom printed napkin order. Contact your Sales Rep or anyone in Customer Service can help you with your customized napkin order. Yes, rush service is available on most of our products for an additional fee. Please contact us for details. We do offer blank napkins, and at a slightly lower cost. Please contact customer service about blank napkins. With napkins, our absolute minimum quantity is 250 pieces. If you are looking at another product, we may be able to do less than minimum, but it often requires a less than minimum charge. Ask a sales representative or customer service rep to verify. It depends on the product. With custom napkins, you aren't limited to ordering only 250, 500 or 1000. If you only want 300 napkins, we can do that! The pricing of 250 would apply if you order 300 for example. No, napkins imprints is all or nothing. The imprint and ink is applied to the full quantity ordered. If you are ordering personalized napkins, it must be done in multiples of 25. Other glassware type items usually need to be ordered by case quantity, or special packaging charges may apply. Yes, please do. Reorders made within 2 years of first purchase have free setup. No you can't ship to a P.O. Box. We ship via Fed Ex or UPS, so we do need a physical location instead. We can ship to APO's yes. This is done via USPS and we are not provided with tracking information when shipping in the mail. Expediting is not possible either. We prefer not to, but we certainly can if that is your only option. 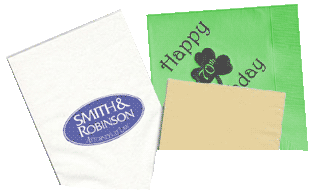 We can rush up to 2500 white napkins with a one color imprint in as little as 24 hours! There would be an $80 lightening rush added to your order. If you are looking to rush a colored napkin, you will have to check with one of our customer service reps and they will check rush for you! Napkins are packed in bundles ranging from 100 - 250 napkins and bulk packaged for large orders.